In 2017, US programmatic digital display ad spending will reach $27.47 billion, with programmatic representing 72% of the total spend in the category. Mobile is driving a significant portion of programmatic growth. The lion’s share of display ad inventory will be a combination of rich audience data, targeting and placement. How will the ads that align with these programmatic buys come into being? What tools are services are used to source the ad content and personalize the ads? Once built, how will the ad performance optimized? To answer these questions we created the Ad Creative Landscape in 2014, now updated for 2017. Inspired by the Display Ad Lumascape, this graphic summarizes many key players and services in the display ad creation process. Here’s a breakdown of the main components. Creative fatigue is costing you more than you think. Facebook heavily penalizes advertisers for failing to refresh your ad creatives. Even for high performing ads, ad fatigue can quickly set in, leading to higher advertising costs and a negative ROI. Here are seven ways to stop creative fatigue from killing your Facebook advertising budget. The path to brand loyalty is no longer a funnel. In fact, there is no set path. Like the newcomers in HBO’s new hit show, Westworld, brands need to focus on creating marketing moments to engage customers with the brand’s storyline. Victor Wong writes on MediaPost examining what ‘Westworld’ teaches marketers about the customer journey. And finally, to kick off 2017, we’d like to share a few of Victor Wong’s predictions for digital marketing this year, including increased use of CRM data onboarding and death of expandable ads. Programmatic advertising enables digital marketers to reach the right audience at the right time more quickly and efficiently than ever before. Advertisers have heavily focused on who they’re delivering the message to and how they’re delivering it, but what about the actual content they’re delivering? Is the creative falling behind in this programmatic revolution? Last year, Thunder teamed up with Digiday Content Studio to research the creative needs of brands, agencies and publishers. Watch this video to learn the top findings from this report. With 1.71 billion active monthly users and advertisers spending $17 billion annually, Facebook is one of the top platforms to advertise on. It’s one of the most effective channels to reach highly targeted audiences. To achieve a phenomenal return from Facebook ads, one factor makes or breaks your success: good creative. Learn expert creative tactics including message tailoring and design best practices that will amplify your Facebook ad performance and maximize your ROI. Programmatic creative refers to the set of ad technologies that enable data-informed, software-assisted creative executions. The purpose of programmatic creative is to unify data and creativity to drive hyper-relevant ads to each audience. 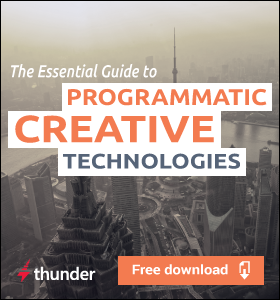 Dynamic Creative Optimization (DCO) falls under the programmatic umbrella, but is not the only way to solve creative problems for programmatic media. Both Dynamic Creative Optimization and Creative Management Platforms (CMPs) maximize the impact of the creative within programmatic and direct advertising through very different approaches. 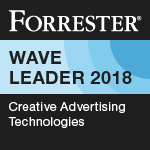 In this video, learn how programmatic creative activates audience data through two main technologies: Dynamic Creative Optimization and Creative Management Platforms. A report published by Yahoo! in 2014 found that personalized ads are 54% more engaging and 45% more memorable compared to generalized creative. 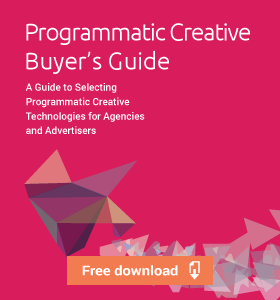 To continuously drive higher programmatic display performance, leveraging the right creative optimization tactics will not only lead to more engaging ads that strongly appeal to your target audiences but also higher conversion rates. Watch this video to learn 5 creative optimization strategies to maximize the ROI of your programmatic display campaigns. When deciding between programmatic creative approaches, advertisers face the marketer’s ‘trilemma’; marketers need to find a balance among personalization, experience, and cost. CEO Victor Wong writes on CMO.com discussing what’s at stake and how to overcome the creative trade-offs. The majority of advertisers show the same generic, generalized creative to all audiences. A targeted creative strategy requires creating a cohesive story, but in a personalized way. As the world gets smaller, Victor Wong examines why global brands need to start thinking small in their large advertising campaigns. With the recent founding of the Coalition for Better Ads and Google’s announcement to crack down on intrusive ad formats in 2017, LEAN ads (light, encrypted, ad choice supported, non-invasive ads) are more important than ever before. Victor Wong published a piece on MarTech offering five tips for creating consumer-friendly programmatic ads. Personalization is critical to boost ad performance, but if marketers use the tactic incorrectly, they could immediately rub customers the wrong way. Victor Wong gives four tips for personalizing ads without being creepy. As a CMP vendor, we have participated in many requests for proposals (RFPs) for Creative Management Platforms (CMPs). The same goes for dynamic creative and programmatic creative. But we still often hear from organizations that don’t have an RFP or RFI template for a CMP. At this year’s Digiday Programmatic Summit, participants were asked to jot down their greatest challenges in programmatic advertising. The response was enlightening. Normally on this blog we try to not talk too much about Thunder. But today I’d like to address these challenges, and show you how Thunder is working everyday to help you overcome them. We recently published new research demonstrating that lower file load size correlates with better viewability in digital ads. Heavier file load size results in slower loads, so it’s not surprising that it can interfere with viewability as well. SAN FRANCISCO, CA – October 6, 2016 – Sara Keesler, Senior Lead Software Engineer at Thunder, was named a Finalist in the Employee of the Year – Business category in the 13th annual Stevie® Awards for Women in Business, and will ultimately be a Gold, Silver, or Bronze Stevie Award winner in the program. To successfully execute cross-platform digital campaigns, different creative messages and variations must be produced to target different audience segments. Yet, two of the industry’s biggest players are falling short of meeting those needs. CEO Victor Wong writes on iMedia discussing how Google and Adobe are failing brand marketers. Though brands and advertisers have done an excellent job effectively reaching the right people at the right time, most campaigns fail to deliver the right message. In The Makegood’s People of Ad Tech interview, Bill Brazell, WIT Strategy Partner, interviews Victor Wong to discuss why the real problem is the widespread failure to customize ads. Lastly, Thunder teamed up with its global DSP and programmatic exchange partners to conduct a study on viewability and load times. After studying billions of impressions, they discovered that beyond simply improving the ad experiences for consumers, faster load times dramatically affect viewability rates. With creative being the biggest driver of performance on Facebook, leveraging the right tactics to optimize Facebook ads is essential to the success of the campaign. An effective ad not only increases engagement from potential customers, but also boosts your overall ROI. More importantly, testing different elements over time will allow you to keep your creatives fresh and improve the results of your Facebook ads. Below are 11 best practices to optimize your Facebook ads and videos. With Facebook ads, the creative is the strongest driver of performance. An ad that resonates with and engages people will reduce your CPM/CPC, protect ad delivery and improve performance on your overall objective. The best part is that Facebook does a lot of creative optimization work for you automatically. With a little extra work, you can reap the benefits and earn great ROI. 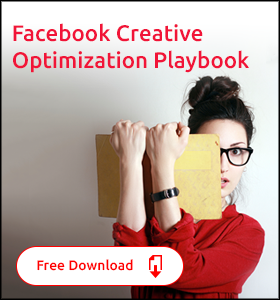 In my new whitepaper, the Thunder Playbook for Facebook Creative Optimization, I outline the 4 pillars of ideal Facebook ad creative. With nearly 2 billion active monthly users, Facebook is one of the most powerful ad platforms to reach highly targeted audiences. Smart bidding, targeting, and campaign management strategies can get you a high return from Facebook ads. But one factor makes or breaks your success: the creative. Creative is the biggest driver of performance with Facebook ads, which is why we’ve published a playbook of creative best practices and expert tactics to help you maximize your ROI. 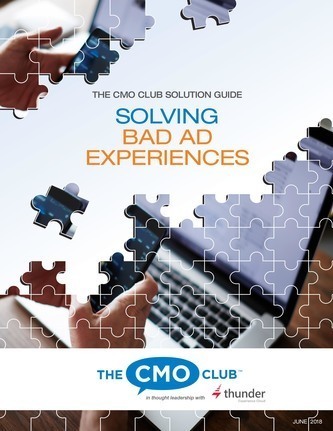 If you are looking for tactics to reduce your costs, protect your ad delivery AND increase campaign performance, this is the resource for you. Download your free whitepaper today.